I can sense change is in the air for me but wonder if I should trust my "sense." A potential opportunity was "exposed" at the office today, making things a bit uncomfortable. I've been looking at expanding my horizons and felt like something was going to come through. I've been proceeding discreetly, so I thought. Things are outta the bag now. I had to "confess my sins," so to say (but not all of them). While I always found confessing my sins to a priest to be awkward and uncomfortable, this wasn't so bad. The "change" I expected hasn't come through, at least not now. An opportunity for change in an unexpected place appeared today and now has potential. Maybe. My lease is up at the end of June and I need to give notice NOW. I have a trip planned to the West Coast at the end of this month. I have a wedding (and anniversary) to attend to in August and a trip to Italy in November. This morning I thought my life would follow a certain path, by the end of the day, it looks like I'm headed in a different direction. The advantage I have is that I'm a single woman with the world as my oyster. I'm in control of my path. Now about the photo. Went out to happy hour with a couple of guy pals tonight and had to snap this photo from the bathroom. 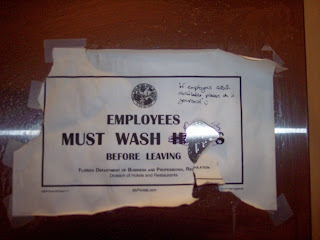 It's the standard, "employees must wash hands" sign and someone wrote "if employees aren't available, please do it your self." Clever.